This feature has been compensated by Scholastic. However, all opinions are mine alone. It is hard to overstate the importance of reading at a young age. It stimulates intellect, imagination and vocabulary. It gives children gifts that they will be able to use productively throughout their lives. This is why it is so important to get kids to buy into reading early on. 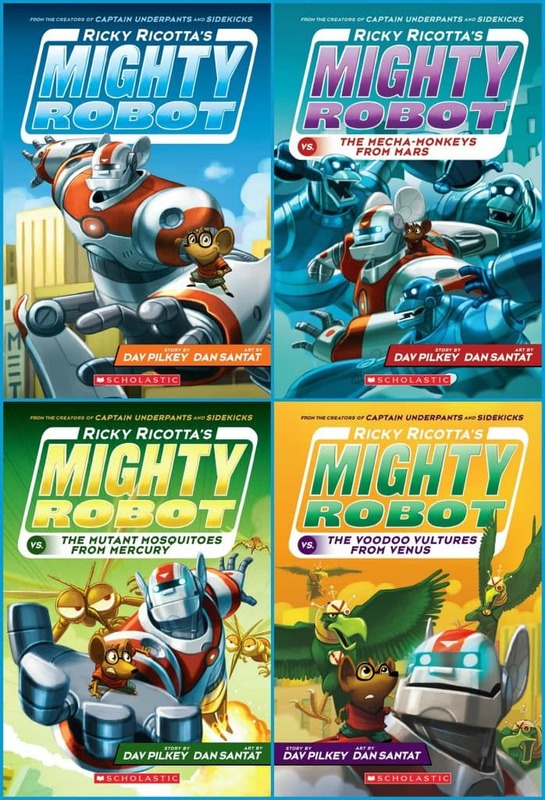 It became apparent to me as soon as I opened up Ricky Ricotta’s Mighty Robot series that these are perfect books for young boys. It bridges the gap between being a “picture” book and a chapter book for those beginning to read on their own. The adventures of Ricky Ricotta kept my son engaged for an extended period of time! I think he loved it from the beginning because he could relate to the main character. What little boy isn’t excited by robots and bad guys? Jonah is very small for his age and lately he has been complaining that kids at his school are teasing him because of his size. At the beginning of the series there were some mice that teased Ricky too. It captured him right from the beginning. Some of my favorite authors are those who started when they were in grade school. When Dav Pilkey was a kid, he suffered from ADHD, reading challenges, and behavioral problems. Dav was so disruptive in class that his teachers made him sit out in the hallway every day. Dav loved to draw and make up stories, so he spent this time creating his own original comic books. In second grade, Dav created a comic book about a superhero named Captain Underpants. His teacher ripped it up and told him he couldn’t spend the rest of his life making silly books. Fortunately, Dav was not a very good listener. Dav has written and illustrated many bestselling books for children, including the Captain Underpants series with over 70 million books in print, the Ricky Ricotta series, and The Paperboy, a Caldecott Honor Book. Dav grew up in Ohio and now lives with his wife in the Pacific Northwest. You can learn more about him at www.pilkey.com. These stories warm my first grade teacher’s heart and I love sharing them with my students. 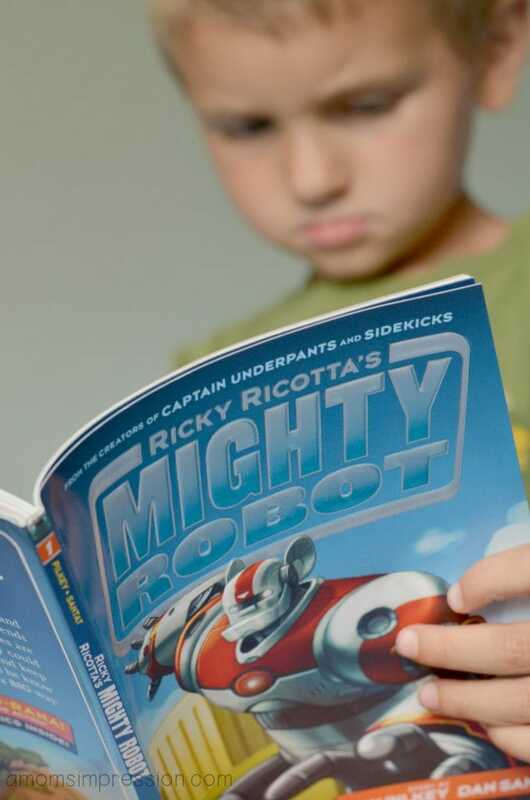 I made a video with Jonah while we read the first Ricky Ricotta’s Mighty Robot book. You can see his interest already peaking as he talked about the book after we read the first half of the first book. A few of the pages also have comic like illustrations in them. Comic books are huge in first grade. Many times they are the only way I can get some of my reluctant writer’s to write. Having this book as a resource when I am teaching writing is going to be a real asset. The illustrator, Dan Santat has had a long career illustrating children’s books. Dan Santat attended the University of California, San Diego, where he received a degree in biology. Thankfully, he had a change of heart and went on to pursue an illustration degree from the Art Center College of Design, where he graduated with honors. After a few years of designing art for video games, Dan switched his attention to children’s books. Since then, Dan has written and illustrated several bestselling books for children, including The Adventures of Beekle: The Unimaginary Friend and Sidekicks. Dan also created the Disney animated hit The Replacements. Dan was born in Brooklyn, New York, and now lives in Southern California with his family. You can find out more by visiting his website at www.dantat.com. As I mentioned before, the series has been around since 2000, but are being re-released with the amazing illustrations and comics inside of them. There are nine books in the series. 5 of them will re-release this year and the next 4 will come out in 2015. I received the first 4 in the series. Little Ricky Ricotta has a problem: the bullies at school pick on him all the time. Until one day, he saves the life of a mightyrobot. 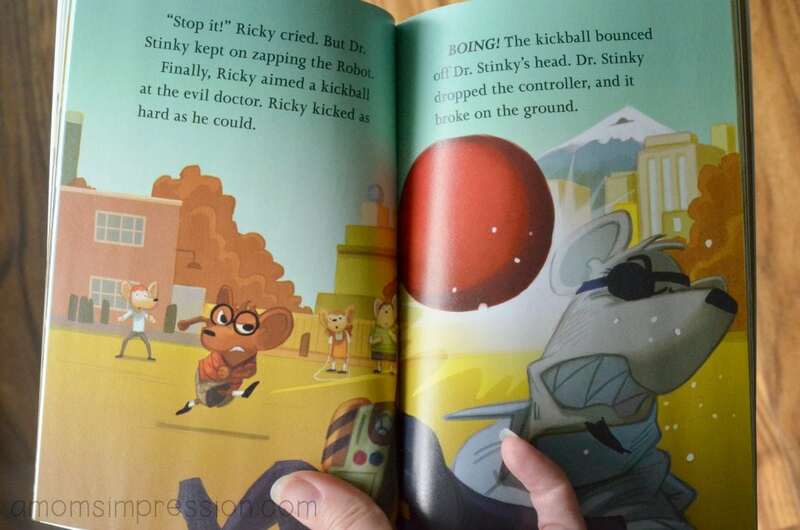 Together, Ricky and his Robot face the bullies, and save Squeakyville from a giant evil lizard monster. That’s what friends are for! I am going to be very excited to buy the rest of the books in the series when they come out next year. If you have reluctant boy readers, I encourage you to get your hands on this series. Your child will love them! 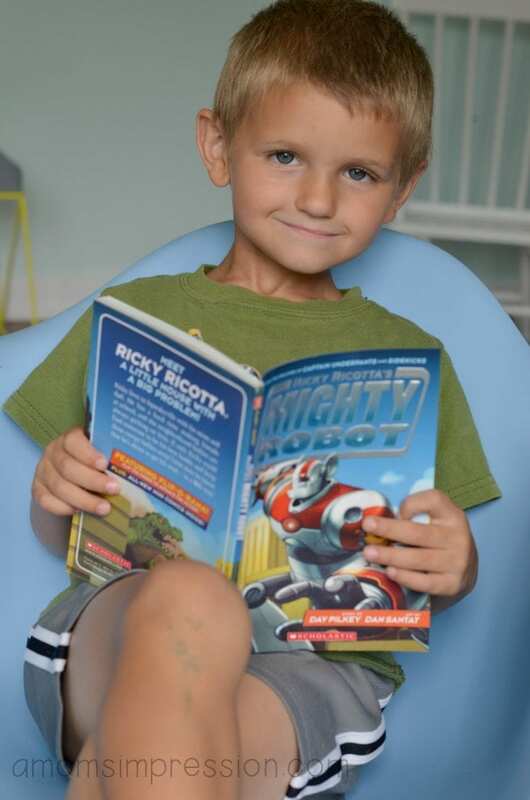 To learn more about the Ricky Ricotta books be sure to visit the Ricky Ricotta Official Site as well as follow Scholastic and ScholasticTeach on Twitter. You can also like Scholastic Parents and Scholastic Teachers on Facebook for more information about wonderful children’s books. What are some of your favorite children’s book series? In a few short years- I am sure this would be a favorite for my son! I will have to pin it to my book suggestions board so I remember! First of all, he is adorable!!! Also, I’ve got to get a few of these for my son. He would love them. These books look really fun. It sure looks like your little guy is enjoying them. We will have to look for these at the library! We love Scholastic books, going to check these out. Sounds like these are good books. Adorable reader you have there..
How cute. I bet my 7 year old would like a couple of these books. Oh my goodness, my boys would love to read this series. Any Dr. Seuss book has always been a huge hit in our home. However, my personal favorite children’s book is the Secret Garden. I think my girls would love these books. They are very colorful and look like fun reads. So adorable! These books look like a fun read. My daughter is really into the Warrior Cat series right now. I am not sure if she would be into these books, but I know my 8 year old nephew would love them! This looks like a fun series! I pinned so I can find them for my boys! Thank you for this! My five-year old not quite ready for chapter books but is ready for something more than picture books. This just may be the series I’ve been looking for. These look like great books to get boys interested in reading! I can’t think of any boys I know who don’t love robots. I love that you’re buying a set for the classroom too. It’s a new to me series and it sounds like one every child would adore. Sons LOVED them! Very very great!! This is my first time ever hearing of this series! Your son looks like he’s really enjoy that book! These are such great books. I can’t wait to share the craft I’m doing for them. My son has always loved reading, and these sound just like the types of books he liked to read when he was younger. Those sound like great books. My son would have loved them when he was younger . I am sure the class will love them. What a great book series for young readers. The artwork is really great. Those look like great reads! My girls would enjoy it! This sounds like a great book for kids. Thanks for sharing the great information. Oh I just have to get these for my kids. 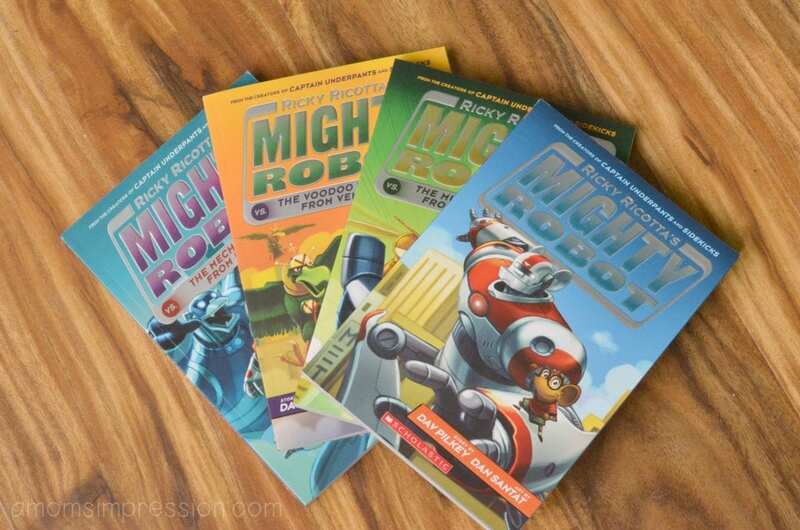 Our youngest bunch ages 6, 4, 3 need some new materials and this “Mighty Robot” series looks perfect. Thanks for sharing. These books look right up to my son’s alley of reading. He loves robots! Your son is so cute! Those books look awesome, what boy doesn’t like robots? Ricky Ricotta series sure are great books! My kiddo likes them too! I haven’t heard of this series before. I’m sure my grandkids would love it. Aww those look like great beginner books. My son would have loved those! My kids are older but they read lots of Arthur books, Blues Clues, Berenstien Bears etc. It is fun when you find a series of books that your kids enjoy reading. I have never heard of this series before. I think my son would love reading these! My daughter really enjoyed the Junie B. Jones books when she was younger. I have not heard of this series before, but I’m going to look into getting them for my nephews. The youngest just started Kindergarten too and has some speech difficulties so I’m guessing much like Jonah he may feel connected to Ricky. We have been reading those as well! We are loving the Flip-o-rama feature. It’s a great bridge between chapter books and comics. I need something like this for girls. Oh this looks like a good series! I’ll have to check it out, I’m glad your son likes it. It seems comic books are the only way to get some kids to read, but I’m all for whatever works! I love that these are tackling the issue of bullying. Thank you so much for sharing this series! My son is in 1st grade and we have been looking for a “my first chapter book” type series geared more toward boys. This is great!